I can still recall the thrill of seeing “Raiders of the Lost Ark” in the theater. A senior in high school, I had already been infected with the archaeology bug. This movie boosted my interest to a whole new level. As Providence would have it, I followed the path of Indiana Jones—at least academically. 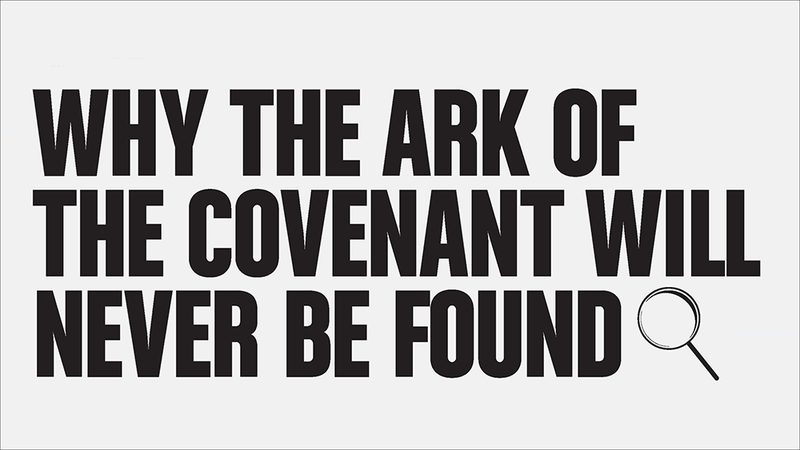 I’m still fascinated by the ark, but I no longer believe it is lost and awaiting discovery. I have Jeremiah to blame for that. The idea that the ark of the covenant survived Nebuchadnezzar’s invasion of Judah is based on the absence of any explicit reference to the ark being among the vessels of gold carried to Babylon (2 Chr 36:5–8). Likewise, the list of items brought back to Judah after the end of the exile makes no mention of the ark (Ezra 1:5–11). The simplest explanation is that the ark was among the “vessels of gold in the temple of the LORD” that Nebuchadnezzar cut to pieces (2 Kgs 24:13). No one would pay to see that movie. From ancient times until the present day, people have resisted the idea that God would allow Nebuchadnezzar to destroy Israel’s holiest object. Testifying to the power of this resistance, there are nearly a dozen theories as to how the ark survived. Some of these theories are drawn from biblical events. Perhaps Hezekiah gave the ark to Sennacherib as part of his tribute payment (2 Kgs 18). Might it have been removed by faithful priests when Manasseh put an idol in the temple (2 Kgs 21:1–9)? Indiana Jones told millions that Pharaoh Shishak took the ark to the city of Tanis in Egypt when he invaded Jerusalem (1 Kgs 14:25–28). Perhaps the most intricate theory involves Menelik I, the alleged son of Solomon and the Queen of Sheba, taking the ark to Ethiopia. The Ethiopian royal chronicle, the Kebra Nagast, presents this idea so seriously that rulers of Ethiopia well into the 20th century had to prove their descent from Menelik I. Other theories grew out of specific passages in ancient texts. Second Maccabees 2:5 records Jeremiah hiding the ark in a cave before Nebuchadnezzar’s invasion. Second Baruch 6:1–9 describes the ark being supernaturally swallowed up by the earth before the invasion, tucked away until the time of Israel’s restoration. The passage plainly shows that the ark would be absent because of the exile. Jeremiah 3:16 also insists that “it shall not be made again”—wording that strongly suggests the ark would be destroyed in the impending disaster; if the ark was not destined for destruction, talk of rebuilding it would make no sense at all. Jeremiah 3:17 reinforces this point—the ark was God’s throne. He sat “between the cherubim” of the lid known as the “mercy seat” (Exod 25:18– 22; Num 7:89). But the passage speaks of a day when Jerusalem itself will be called God’s throne. We read about this in Revelation 21:2–3: “I heard a loud voice from the throne saying, ‘Behold, the dwelling place of God is with man. He will dwell with them, and they will be his people, and God himself will be with them as their God.’ ” A recovered ark of the covenant doesn’t fit this picture—it would be a disappointment.